The stories to know as Election Day 2016 begins. 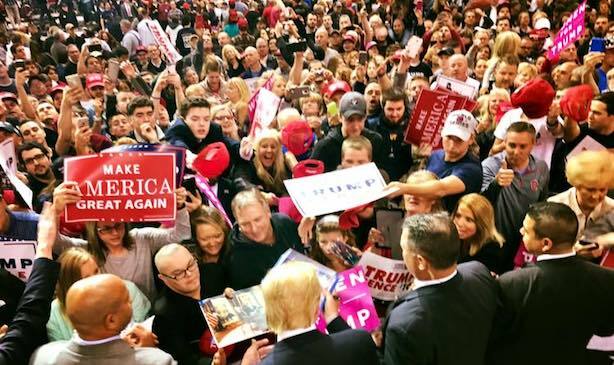 Donald Trump campaigns in Ohio in the race's closing days. (Image via Facebook). Setting the stage. Hillary Clinton is the favorite to win the presidency according to betting markets, financial markets, and most polls and Electoral College predictions. Democratic insiders are extremely confident Clinton will become the first woman elected to the country’s highest office. Donald Trump has a small lead in after-midnight voting in New Hampshire. PR pros are with her. In an informal survey of communications executives, nearly all said Clinton will win the Electoral College and the popular vote when all the ballots are counted Tuesday night (or Wednesday morning). How the race came to a close. Contrasting speeches by Clinton, accompanied by a star-studded cast including Bruce Springsteen, former President Bill Clinton, and President and Mrs. Obama at Independence Hall in Philadelphia, and Trump in New Hampshire. In a surprise announcement, Trump claimed the support of New England Patriots quarterback Tom Brady — his wife, supermodel Giselle, disagreed — and coach Bill Belichick. Tonight: Awkward proximity. Clinton and Trump will be mere blocks away from each other at their respective victory parties in New York City. Donald Trump Jr. said on MSNBC’s Morning Joe that his father will concede if he loses a "fair" race. Early voting patterns in Florida and Nevada are a good sign for Clinton. How the "I Voted" sticker got its start. One image that will be shared thousands of times today on social media is the ubiquitous "I Voted" sticker given to citizens who cast ballots in the presidential election. Time looks at its origins. What’s next? The pressure could be on big business regardless of who wins the election, considering how much corporate influence came under fire in the election, according to The Wall Street Journal. Here’s a guide to how the markets could react to a Clinton or Trump victory, via Bloomberg. Samsung’s expensive apology. The company ran full-page apology ads in The New York Times, The Wall Street Journal, and The Washington Post on Monday, saying it "fell short" on promises of safety and quality. A French customer told the Associated Press that her Samsung Galaxy J5, not the widely recalled Galaxy Note 7, caught fire on Sunday. Facebook takes on LinkedIn. The social network said Monday night that it is testing a feature allowing companies to post job openings and receive resumes through the platform, putting it on a crash course with LinkedIn. Facebook told TechCrunch that it’s noticed small businesses posting job openings on its site.